Overwatch competitive season 4 has just recently started, what rank are you? Let's be honest, I think most of us think the placement ranks are kinda broken. This season I won 3 matches/ lost 5 matches/ tied 2 matches. I was placed at 1590. 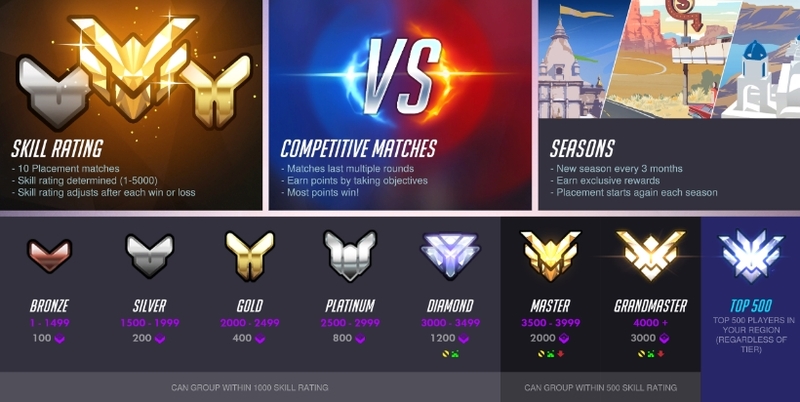 I was somewhat mad at this because it reflects off of the past season where I ended at about 1800. This seasons meta, wow, so... Bastion IS the new meta this season. With his recent buff, he can't be stopped. Also with the new hero, Orisa (I haven't played her yet because I'm on Xbox One), she is part of the meta and could possibly replace Reinhardt and/or Zarya. I have come to a conclusion that the more consecutive wins you get in comp, the more SR you will receive per match. I know this because I went on a 12 win streak and began to get 80 SR each game before I lost. One of the problems in the Overwatch was the lack of a good team. It was better to have a coordinated group and quite clever allies, but I didn't have them. Therefore, a single shooter, where I haven't already depended on the team I like more. CS GO isn't only my way to get rid of stress and throw out aggression, but also the opportunity csgo sell https://skinsmarket.com/ skins and get good money actually. So I can update the hardware after sent profit on WebMoney wallet, buy new games and this is definitely an additional motivation. Thanks for sharing the updates of game. You can Buy Overwatch Accounts for achieving the higher ranks in game.